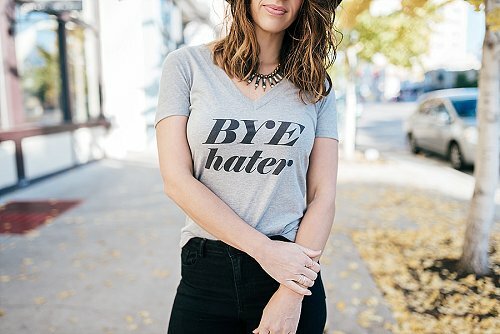 I love this Bye Hater top from Style Lately because that's how I deal with haters or naysayers...I just say BYE and ignore them. They're not worth my energy! This is easier said than done though! Last year, I dealt with a few haters. Some people were spreading negative gossip about me that was NOT true and it was heartwrenching! It was one of the hardest things I've had to go through because it really hurt to have people that I knew falsely accusing me or judging me when they didn't know the actual truth. During this difficult time, I watched a video from Brene Brown, called "Why Your Critics Don't Count" and it was life-changing! It helped me learn to say "Bye Hater" and ignore them. I highly recommend watching this 22-min video if you've ever had to deal with naysayers.